The detergent and rinsing effect cleans plastic glassware to higher standards of regular detergents and rinse aids (standard Rinse Aid’s proved totally ineffective on plastic glassware). We have found that using Proton’s new detergent and rinse aid actually helps to significantly increase the ‘life span’ of the plastic, holding the ‘yellowing’ effect off for a while longer. 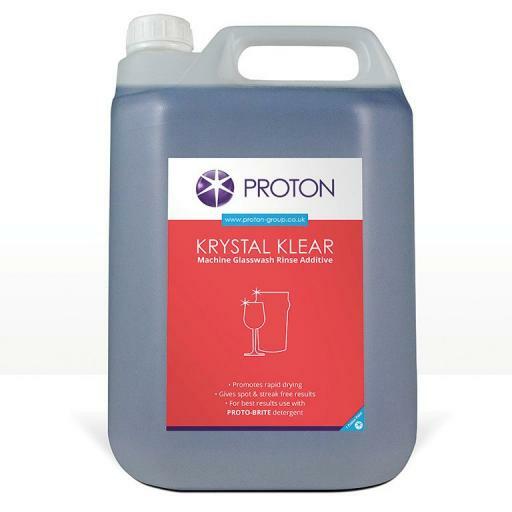 Provides Pristine glassware under optimal operating conditions, promotes rapid drying and gives spot and streak free results. To be used in conjunction with Protobrite.